A Wavell State High School student has been officially recognised by Mines Minister Dr Anthony Lynham after graduating from an engineering camp in Mount Isa last month, said the Queensland Resources Council (QRC). QRC Chief Executive Ian Macfarlane said year 11 student Maggie-May Hornigold took part in the Queensland Mineral & Energy Academy (QMEA) Make it Now in Engineering Challenge camp along with mentors from Glencore. “Maggie-May is another example of a young woman living in the south-east corner who is interested in perusing a career in the resources sector. This would be a rewarding pathway for Maggie-May, and she’s not alone – with our industry aiming to achieve 20 percent female participation in non-traditional roles by 2020,” he said. Dr Lynham said the Government was a proud partner of the QMEA which is Australia’s largest industry and education partnership. 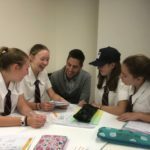 “The QMEA is a partnership between the QRC and the Queensland Government under its Gateway to Industry Schools program. 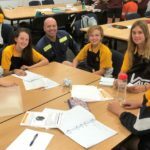 It’s a program that encourages students from all over Queensland to get involved with science, technology, engineering and maths or trades before they finish school,” Dr Lynham said. Mr Macfarlane said the QMEA had now grown to 46 schools throughout the State with scope to add more schools especially in the south-east. “A recent report by industry identified that the main reason students were not choosing mining related careers is because there is a lack of knowledge about the opportunities in the sector. However, results show that students from schools involved with QMEA have significantly higher numbers of graduates who take up apprenticeships and tertiary education involving STEM subjects,” he said.